The story behind the RidersWest Spring 2013 cover photo by Steve Shannon. For the past 12 years, the Western Canadian Watercross Association has been working hard to promote this unique and exciting watersport. 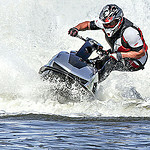 Is it an ATV or a personal watercraft? It’s both. The Quadski is the world’s first high-speed personal sports amphibian. The Open Country A/T II offers outstanding all-season performance, an aggressive new tread and a quiet ride over the life of the tire. If extreme online racing is your thing, you may want to try out the new ATV Wild Ride 3D for Nintendo 3DS. Released on March 7, 2013, in the Nintendo eShop, ATV Wild Ride 3D from Renegade Kid features tricked-out, larger-than-life arcade-style ATV racing. If you want a pair of motorcycle sunglasses that are designed to look good and allow you to see clearly while protecting your eyes from the hazards of the road, consider the new HD Grit sunglasses from Wiley X Inc.
Polaris Industries Inc. (NYSE: PII) today announced the acquisition of A.M. Holding S.A.S., which operates under the name Aixam Mega S.A.S., a privately owned company based in Aix-les-Bains, France which manufactures and sells enclosed on-road quadricycles and light duty commercial vehicles in Europe. Victoria Hett, where to begin? In the 16 years that she has been racing off-road dirt bikes, this 28-year-old from Vernon, B.C., has won three regional championship titles, a world championship title and several first place finishes.